Scientific Name: Citrus aurantium amara L.
Peel: bitter-tasting flavonoid glycosides, flavonoids, essential oil. Flowers: flavonoids, essential oil, anthranilic acid methyl ester, bitter principles of the limonoid type. Everyone is familiar with the sweet oranges without which no fruit stall is complete. 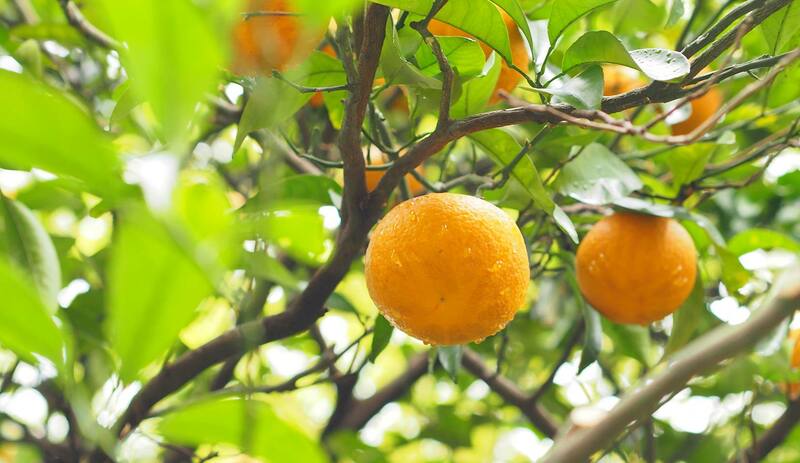 But probably few people realise that this fruit is a sweet variety of the bitter orange which was already being imported to Italy from China in the 11th century, much earlier than its sweeter sister, which only arrived in Europe in the 15th century. The evergreen bitter orange tree bears dark-green, leathery leaves and, on its young branches, thin, flexible thorns which can be up to eight centimetres long. The tree can reach a height of up to eight metres. Its white, five-petalled flowers give off an intense fragrance. Unusually, not all flowers have the female pistil (consisting of ovary, style and stigma) as well as the male stamens: some flowers have only male stamens. The fruit of the bitter orange is very similar to the sweet orange, but is smaller, with a diameter of only seven to eight centimetres. The sphere is slightly flattened and the skin is thicker and more dimpled than that of the sweet orange. The fruit flesh tastes sour, while the peel and the skin surrounding the fruit segments have a strong bitter taste. Around the Mediterranean the ripe bitter oranges are harvested in January and February. Because its bitter principles stimulate the digestive system, bitter orange peel is used to combat lack of appetite and digestive problems. The food industry uses this peel to make candied orange peel and orange marmalade. Peel and juice are also ingredients of Curacao liqueur and the Italian soft drink aranciata amara. Different parts of the bitter orange also provide three different essential oils: the green leaves, twigs and unripe fruits contain the very aromatic petitgrain oil; the peel of the ripe fruit supplies the bitter orange oil found in many lemony perfumes; and finally, steam distillation of the flowers gives the essential oil neroli, which together with petitgrain is an ingredient of eau de cologne. Orange blossom water is a by-product of this steam distillation. Neroli oil is used in aromatherapy because it is relaxing and spasmolytic but also has a stimulating effect. Folk medicine uses the dried flowers of the bitter orange as a soothing tea to combat sleeping disorders and nervous tension. a robust stock for other citrus fruits, i.e. as a strong stem on to which the branches of other citrus types were grafted. The famous “James Keiller & Son Dundee Orange Marmalade” came about towards the end of the 18th century, and was more or less born of necessity. A Spanish trading ship from Seville was forced to anchor in Dundee in Scotland when a threatening storm prevented it from continuing its journey. This ship was carrying bitter oranges which were no longer quite fresh, so the crew sold them cheaply. The buyer, John Keiller, gave them to his wife Janet (1735-1813), who cut them into small pieces and boiled them with a large quantity of sugar because the raw fruit was inedible. The result was the first orange marmalade, which Janet Keiller sold so successfully in her confectionary shop that in 1797 the Keillers established the world’s first marmalade manufactory in Dundee. They named it after their son, James Keiller. That the bitter orange marmalade is so popular in the British Isles may well be because it stimulates the digestive system and makes the hearty traditional English breakfast of bacon and eggs more digestible. The orange blossom water for Dr.Hauschka Med Children Sensitive Orange Tooth Gel and for Dr.Hauschka Lavender Sandalwood Body Moisturizer is obtained from bitter orange flowers grown in certified organic plantations north of Beirut in Lebanon. These plantations belong to the only certified organic distillation plant in Lebanon, the Distillerie Franco-Libanaise. The sensitive flowers are harvested exclusively by women, usually in March. Immediately after harvesting, lorries transport the fragrant blossoms to the distillation plant, where the precious neroli oil and the by-product orange blossom water are obtained by steam distillation. In the formula of Dr.Hauschka Med Children Sensitive Orange Tooth Gel, the orange blossom water serves to give the gel a pleasant, refreshing taste. The costly neroli essential oil also rounds off the fragrance composition of Dr.Hauschka’s Rose Day Cream, Firming Mask, Rose Nuturing Body Cream and Regenerating Day Cream.